To some it may seem old fashioned, or a thing of the past, but family meals are a proven way to help strengthen families. Years of research has found that the more children eat dinner with their families, the less likely they were to smoke, drink or use drugs. Why? 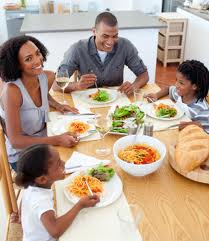 Eating dinner together has a positive effect on social development, family communication, nutritional intake and the development of the family structure. The conversations that go hand-in-hand with dinner help parents learn more about their children’s lives and help them better understand the challenges their kids face each day. CASA research shows teens are at a greater risk of substance abuse as they move from middle school to high school. It is especially important for parents to stay involved during this time. Dinner is one way to make this happen. It is never too early or too late to start the tradition of regular family dinners with your children. Set the mood. Try eating at a clutter-free table without the television in the background, and no handheld devices. Divide and conquer. Let everyone help. Many busy hands make the job easier. Plan ahead. Be sure all family members know what you expect, when to have their hands washed and their appetites ready. Dinner does not have to be at the same time every night but let family know in advance. Posting the menu on the refrigerator is a good idea. Let the children choose what foods they would like to eat. Cook up the conversation. Save unpleasant topics for another time. Be a good listener. Practice reflective listening and use “I” messages. “May I be excused?” Clearly define the end of the meal. Relax, and enjoy the meal together. Remember that families do not change overnight. Make small changes each day or week. Time flies by so quickly in this fast-moving world, but remember that what your kids really want at the dinner table is YOU! Center on Addiction and Substance Abuse at Columbia University (2001), May 9, 2001. http://www.casacolumbia.org/index/htm. Compan, E., Moreno, J., Ruiz, M.T., & Pascual, E. (2002). Doing things together: Adolescent health and family rituals. Journal of Epidemiology and Community Health, 56: 89-94. Ohio State University Extension, Ohioline, Factsheet FLM-FS-4-03. http:/ohioline.osu.edu.